Sanctuary Santa Cruz & Your Allied Rapid Response can verify that ICE picked up a Watsonville man around 4:30am this morning, Wednesday, February 7, near Calabasas Road and Bradford Road. Sherrif Hart has confirmed that the Sherriff’s department received a “courtesy call” from ICE informing him they would be making an arrest in the area. The man and his wife were on their way to drop their young children off at daycare when they were stopped by 5 ICE officers in 2 unmarked vehicles. According to his wife, the detained man has no criminal history. The family has been put in touch with legal and other support services. Please keep them in your thoughts and prayers. We have had additional reports of ICE activity in the area throughout the day. The rapid response team received report of ICE activity near Amesti School in the afternoon, but could not confirm ICE presence. Officials later confirmed that this was a false report. The rapid response team checked out another report of ICE activity on First St. in downtown Watsonville around 9am, but could not confirm that ICE had been in the vicinity. Continue to be alert and be prepared to call the YARR hotline at 831-239-4289 if you suspect ICE activity in our community. 3 Santa Cruz DREAMers will travel to Washington DC to demand a #CleanDREAMAct ahead of a January 19 vote in Congress. If you live in Santa Cruz, chances are you’ve already met a DREAMer. Around 1,700 young people in the Santa Cruz/Watsonville area currently have protections under the Deferred Action for Childhood Arrivals (DACA) program. If Congress does not pass a Dream Act by January 19, these young people face an uncertain future in the only home country they have known. Nationwide, 15,315 people have already lost their deferred action protections since the repeal of DACA on September 5, 2017. After March 5, 2018 thousands more will begin to lose their protected status every day if Congress does not act. DREAMers have mounted an inspiring fight for their rights and the rights of all undocumented people. Three local youth have joined the fight, launching the Santa Cruz DREAMer Project, under the umbrella of the Sanctuary Santa Cruz network. After a weekend whirlwind of fundraising involving the sale of 700 tamales, the three have raised enough money to to pay for their travel to Washington DC January 13-20. They plan to join in a week of actions designed to send a message to Congress: No DREAM, No Deal. Come hear their stories, learn about the fight to for a clean DREAM Act to finally grant them a path to citizenship, and to find out how you can help, come “Meet the DREAMers” on Tuesday evening, January 11, 2018, 6:30-8:30 at the Neary Lagoon Apartments Community Room, 81 Chestnut Street. The three local youth will be joined by Barbara Hernandez, one of the #DREAM7 arrested in a sit-in at the congressional office of Rep. Carlos Curbelo (R-FL). While in jail, the 7 DREAMers plus one ally went on hunger strike for 7 days, refusing to give their names until Congress passed the DREAM Act. Though they ended their hunger strike when Congress passed a temporary spending bill without a Dream Act, they have vowed to return and fight for passage of a Clean DREAM Act in January. For more background on the #DREAM7, read Letter From a DC Jail. I fear you may be a thief. That will award you for it. I will surely beat you. By the name of Joseph. The queen in the heavens. We offer with our hearts. Have come today to honor us. What news do you bring me? Where are you going little shepherd? Cottage cheese, lard and wine. Where are you going shepherd? As to God, I’m bringing my heart. “Today I sent a letter to an ICE immigration official urging an emergency stay of removal on behalf of one of my constituents, a valued member of my community, who is set to be deported imminently. My constituent has lived here for over a decade with an extended family including children, works for a local employer, and has built a productive and quiet life here in the Monterey Bay area. That quiet life was welcomed and deserved after this person fled a violent country over a decade ago. But this person, who has no criminal background, was detained during the February raid conducted by ICE with the help of the Santa Cruz Police Department, without an arrest warrant or a home search warrant. This person has no gang affiliation, which was the purported purpose and target of the raid. Shortly after I heard about the raids in my district, I voiced my outrage that the Department of Homeland Security used a criminal investigation into gang activities as an opportunity to conduct an immigration raid with the help of Santa Cruz Police Department. At that time, I stated that those raids undermined local trust of law enforcement and would cause fear that loved ones, neighbors and friends could simply be whisked away in the dead of night without warning and without cause. If my constituent is deported, the case will exemplify the collateral damage of such raids — eroded community trust and reduced public safety. Author VickiW108Posted on July 3, 2017 July 3, 2017 Categories UncategorizedLeave a comment on What is a Sanctuary City? More than one hundred people gathered at Peace United Church on Saturday, March 11, prepared to learn how to effectively document and monitor the raids on immigrants that are beginning to bear down on Santa Cruz County. The event, organized by a local group named YARR, Your Allied Rapid Response featured information on current organizing activities in Santa Cruz, followed by a two-hour training led by San Francisco Bay Area immigration lawyers who work with a Bay Area group called Migra Watch. The audience gave the two main trainers, one Iranian-American woman and one Mexican-American woman, a standing ovation at the end of their presentation. The trainers explained to the crowd what ‘rapid responders’ would be expected to do. 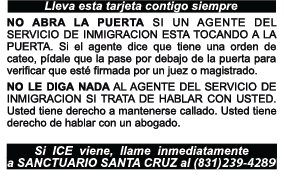 In the Bay Area, the phone number of the Migra Watch Hotline is being widely disseminated throughout the immigrant community. If there is a raid, anyone can call that number and a Migra Watch despatcher will immediately send a text message to a rapid responder who lives in the vicinity of the raid (within a radius of 2-5 miles). Once the message is received, the volunteer will text back “I’m on my way,” getting there as soon as possible to begin the documentation process. A similar system is being set up in Santa Cruz. In order to make the situation more real for the audience, the two main trainers acted out two versions of a raid scenario. In the first version the observer in the role-play was more confrontational, creating a situation in which her phone was confiscated by the police. In the other, the observer kept videoing the situation but slowly inched backwards as the police yelled at her to back up. By minimally complying with police orders, the observer was able to keep videoing the raid without losing her cell phone. The trainers emphasized again and again that it is a constitutional right to document any police action. Trainers emphasized the importance of staying calm, not talking with the police except to repeat that: “I’m here to document”, and capturing as much information on video as possible. Prospective observers were told to get badge numbers, number of agents, number of people detained, license numbers, identification (or lack thereof) on police vehicles, hate words used, examples of excessive force, weapons used, property damage, property confiscated etc. If more than one observer shows up, the second person can focus on videoing observer #1 to gather evidence on possible violation of observers’ constitutional rights to document. A third person could take notes, using a checklist developed by Migra Watch. All documentation is being collected in order to protect and defend immigrants in court. Trainers emphasized that the documentation should never be sent out over social media, an act that could potentially put the immigrant family members at more risk. Trainers said that after a raid, if the family is willing, observers can interview the family members to get more information about the siutaiotn. The family’s needs must always be respected. During an especially poignant moment, one of the trainers, the Iranian woman who now works as an immigration lawyer with Migra Watch, talked about her own childhood as an undocumented immigrant in the U.S. “People often think that I came to America to seek the American dream. That is false!” she said emphatically. “How many of you know that the United States overthrew the democratically elected government of Iran in a CIA directed coup in 1953?” Her situation reflects that of many immigrants in this country whose families fled the violent aftermath of U.S. military and political intervention in their countries. The pre-training session also included tables inviting participants to sign up for groups that are focusing on legal counsel, direct action, story-telling, fund-raising, tech help and more. A free bilingual workshop for childcare providers, teacher, and others who work with young children. Call CDRC to register at: 831-466-5820. Santa Cruz is processing the effects of the recent ICE raids throughout our community as well as the uncertainty of the national political climate. While all children are affected by the fear and worry in the air, families of our documented and undocumented immigrants are particularly vulnerable. This uncertain atmosphere has a profound effect on the children in our care. ∗ Putting a plan in place for families in case of emergency. ∗ Support for caregivers under current stress. Sponsored by Santa Cruz Sanctuary, Santa Cruz County of Education, and Community Bridges. Please call CDRC to register – 831-466-5820.